These lines by Thomas Davis inspire the title for the Soldiers & Chiefs Exhibition at the National Museum in Collins Barracks, Dublin. The exhibition, also entitled The Irish at War at Home and Abroad since 1550, is the largest undertaken to date by the National Museum and has three themes: Soldiering in Ireland, Soldiering Abroad and Soldiering in the 20th century. These three themes trace the Military History of Ireland and illustrate some of the significant episodes of that history, including the Flight of the Earls, the Wild Geese, the battle of Fontenoy, and the Irish participation on both sides in the American Civil War. The section dealing with soldiering in the 20th century and the turbulent years of the early part of that century and in particular the Irish soldiers who fought for the British Army in World War One is a tribute to these men. In the museum gallery covering this period of our history their story is told alongside that of the founding of the Irish Volunteers in 1913, the Easter Rising and the War of Independence. It is a moving tribute and a reminder that the Irishmen, soldiers and volunteers depicted here, fought and died for a cause that they believed in, even though their loyalties at that time were at odds with each another. 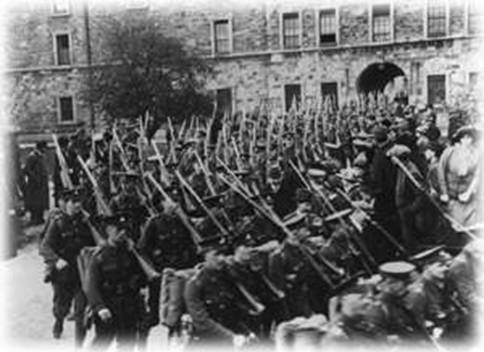 D Company 7th Battalion Royal Dublin Fusiliers marching out of The Royal Barracks, (now Collins Barracks), enroute to The Dardanelles, April 1915. The exhibition shows the emergence of the three Irish divisions, the 10th, mainly consisting of regular soldiers and reservists of the Irish Regiments from both North and South, the 16th drawn predominantly from southern Irish Catholic members of John Redmond’s National Volunteers, and the 36th, mainly consisting of Protestant men from the Ulster Volunteer Force, founded in 1913 by Sir Edward Carson to resist the introduction of Home Rule. It follows the heroic course of these divisions, the 10th in Gallipoli, the others on the Western Front. 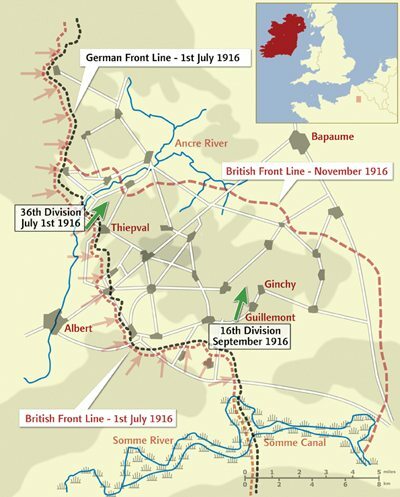 The battle for Messines ridge, where the 16th and the 36th Divisions fought side by side, is also included. Eighty one years later the Island of Ireland Peace Park built there to honour all those from the island of Ireland, who fought and died in the war, was opened by President McAleese, in the presence of Queen Elizabeth 11 of England and King Albert of Belgium. This gesture began the gradual awakening from the amnesia that attended this period of our history and now this exhibition, together with the annual National Day of Commemoration, the 90th commemoration of the battle of the Somme in November 2006, and the annual Remembrance Day Ceremony at Islandbridge shows that we as a nation can recognise and respect the divided loyalties of a different era. Sean Lemass, Taoiseach and veteran of the 1916 Rising, speaking over forty years ago on this subject said: “In later years it was common – and I was guilty in this respect – to question the motive of those who joined the new British armies at the outbreak of the war, but it must, in their honour, and in fairness to their memory, be said, that they were motivated by the highest purpose. “ By the end of the war over 200,000 men from the island of Ireland had volunteered to fight and 50,000 would be killed or die from their injuries.